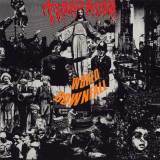 One of the greatest Grind albums ever, World Downfall was created by something of a supergroup in unusual circumstances. Released after Terrorizer had split up as one of the early Earache releases thanks to the lobbying of Napalm Death’s Shane Embury, World Downfall was recorded and mixed in eight hours by a lineup that included former Nausea vocalist Oscar Garcia, Morbid Angel’s Pete Sandoval and David Vincent, and Jesse Pintado, later to join Napalm Death. With a lineup like that, how could it not be awesome? Everything about this simply screams legendary, from a certain Scott Burns providing a deep, dense sound for which he’d become famous, to the fact it was recorded before Altars Of Madness, even if it was released slightly later. And as mentioned, that early Earache tag is a mark of quality on extreme metal like none other. Don’t expect anything like Morbid Angel, however. The closest band to Terrorizer are Napalm Death (which is no surprise considering I’ve mentioned them twice already!) albeit with a more Death Metal-influenced sound. Thrashing riffs from Pintado join up with Commando Sandoval’s light-speed battery and Garcia’s deep growl to create an overall grind sound that’s surprisingly catchy and completely of its era, a classic extreme metal album that still rocks my socks over twenty years after it was released. From start to finish, it’s a distillation of sheer metallic awesomeness that’s all the more brilliant for being the only thing that line-up of the band produced (we’ll deal with Darker Days Ahead another time). Moreso even than the godfather of Grind that is Napalm Death’s debut Scum, World Downfall is the epitome of grindcore – you can’t hear the relentless impact of After World Obliteration and not hear the glory days of Death Metal, or the loud bass and ferocious speed of Storm Of Stress and the roots of the Nasums and Rotten Sounds that would come to define Grindcore in later years. It’s certainly the most accessible Grindcore album I’ve ever heard. Fear Of Napalm alone is worth the purchase price, rumbling bass beginning soon building to some of the catchiest riffs you’ll ever have heard, a razor-tipped grinding whirlwind. And the variety elsewhere is quite impressive, never leaving the land of Grind but never seeming to repeat itself or provide one riff where three will do. True, some more modern fans have complaints about this album, that there’s nothing as chaotic as the Pig Grinders of the grind world. A steady hand always rests on the tiller of the good ship Terrorizer in the form of Sandoval, whose precise battery is the backbone of the music, and has never sounded better. Varied and technical, the man is a god for a reason, and this is one of his best performances, a vital cog in the grind machine. Ultimately, all involved more than give their good names a polishing, and really there is no excuse for any grinder worth his or her salt not owning this and playing it daily. World Downfall is completely, utterly classic.